Have you ever wished you could extend the colorful, fresh harvest of the summer season all year long? With Wyman’s of Maine, it seems you can. In August, during the harvesting season of lowbush wild blueberries, Wyman’s freezes their crop within 24 hours of picking to offer the freshest wild blueberries throughout the year. And better yet, enjoying delicious wild blueberries from the freezer for breakfast, entrees, salads, and desserts is one of the best ways to get your required daily serving of fruit, integrate nutrients into your diet, and indulge in the taste of a summer past. Celebrate the end of wild blueberry harvest season, and enjoy an endless summer, with Wyman’s of Maine. Is there a difference between wild and regular blueberries? Yes! In fact, wild blueberries are much smaller than cultivated blueberries, with a more concentrated sweet and tart taste. They are called “wild” because they grow from a naturally occurring root system. The other “cultivated” blueberry is a high bush blueberry, growing on large bushes 8 feet tall. Wilds are exclusive to the regions of Maine and Eastern Canada, where large stretches of barrens produce this indigenous fruit. Wild blueberries also have two times the amount of antioxidants as the cultivated variety due to their assortment of color and high skin-to-pulp ratio (the skin is where all of the concentrated antioxidants are stored). Again, since wild blueberries are so much smaller than their cultivated cousins, a cup may fit 80 cultivated blueberries in comparison to 150 wilds. That means the wild blueberry benefits are technically greater, since most of the nutrients are found within the skin. I received a complimentary bag of Wyman's Organic Frozen Blueberries for review. I decided to whip up a batch of homemade pumpkin blueberry muffins. To make them...you can use your favorite pumpkin bread or muffin recipe (to make from scratch) or you can purchase a pre-packaged box mix. I do it both ways depending on time. The bag I received for the review is a large resealable bag. I simply measured out 2 cups of the frozen blueberries and left them thaw for 30 minutes in my measuring cup as I mixed up my muffin batter. Once my batter was prepared...I used a silicone spatula and gently folded-in the organic blueberries until blended. Spoon the batter into greased muffin cups or line your muffin pan with paper liners like I did. I then baked them in a 350 degree oven for 12 to 14 minutes. Once done...remove and let cool on a wire rack or serve them warm. We like our's served warm and smothered in honey butter. Delicious! One of the things I love about Wyman's of Maine Fresh Frozen Blueberries is that they are frozen quickly. Their blueberries are some of the largest blueberries I've ever seen. They are big, plump and juicy...just like a high-quality blueberry should be! They are flavorful and are packed with delicious blueberry goodness! When using frozen blueberries in any recipe...Wyman's of Maine is my preferred brand. I love using them in various muffins, breads, cakes, pies and smoothie recipes and always obtain delicious results. About Wyman’s: Founded in 1874 by Jasper Wyman, Wyman’s of Maine is a family owned company with generations of experience and leadership in growing and distributing wild blueberries. Wyman’s grows their wild blueberries on more than 10,000 acres of their own barrens, as well as in the fields of other growers from Maine and Eastern Canada. Over the course of many years, the company has perfected the science of fresh freezing fruit to maintain optimum flavor and nutritional benefits. Disclosure: Shelly H. received a complimentary bag of Wyman's of Maine Blueberries. No monetary compensation was received. Shelly's thoughts, opinions and words are 100% her own and were not influenced by the company. I did not realize that wild blueberries were more healthful than regular blueberries. 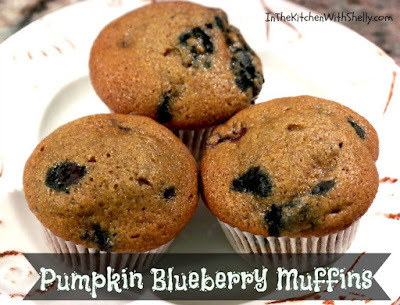 I love the combination of pumpkin and blueberries in his recipe.